Meanwhile, Van Gaal also told a news conference in Seattle how he told striker Robin van Persie he had no future at Old Trafford after a round of golf at the end of last season. And he was unconvincing when asked about the futures of club record signing Angel Di Maria and De Gea. The Old Trafford club will not consider selling De Gea, whose contract expires in 2016, unless they receive a record fee for a goalkeeper. Asked about De Gea's situation, Van Gaal added: "I cannot say anything. His attitude is fantastic. It is stupid to ask." However, he did admit that a move for another experienced goalkeeper was "dependent on David De Gea". Valdes, who won La Liga six times with Barcelona, joined United as De Gea's back-up after recovering from major knee surgery. After new signings Bastian Schweinsteiger, Morgan Schneiderlin and Matteo Darmian faced questions from the media, Van Gaal responded to questions about Valdes' absence. He said: "Last year, he refused to play in the second team and there are other aspects you need as a keeper at United. "When you are not willing to follow those principles, there is only one way and that is out. "It is a big disappointment. It is a pity because we have given him the opportunity to rehabilitate, gave him a contract and then he is fit to play." Valdes, whose contract expires in 2016, played gainst Liverpool in January, Chelsea in February and Spurs in March for United's under-21 sides. His only first-team start was in United's final game of last season, and Van Gaal added: "I played him at Hull because I wanted to help. I am always a very social human being." Van Persie has left United for Turkey's Fenerbahce after three seasons at Old Trafford. Explaining the decision to let the 31-year-old Netherlands international leave, Van Gaal said: "He knew already what was coming from the day we played golf. "After we played golf, we talked about the perspective for him at Manchester United. I think he did a very good choice." Van Gaal was also asked whether midfielder Di Maria would be staying at Old Trafford after speculation the record £59.7m signing is unsettled in Manchester and will join French champions Paris St-Germain. "No idea," said the Dutchman. "We shall see. Now he is still a member of Manchester United." Where does all this leave United's goalkeeping situation? United have made it clear throughout the summer that they would only let De Gea go if Real Madrid offer in excess of the £32.6m Juventus paid Parma for Gianluigi Buffon in 2001. Real are unwilling to pay that much for a player they could sign for nothing when his contract expires in 2016. Indeed, so far, they have yet to make a bid for the former Atletico Madrid player. It it also understood United would be willing to let De Gea go if long-serving Real defender Sergio Ramos went the other way. It was felt Ramos wanted to move, but Real rejected United's only offer so far of £28.6m. The Red Devils are prepared to offer De Gea about £175,000 a week to stay - understood to be more than double his current wages. On Monday, Ramos flew to Australia with Real, having apparently been named captain by new manager Rafael Benitez. Do Real and United have other options? This is where it gets interesting. Real have just sold long-serving captain Iker Casillas to Porto. Of the three goalkeepers they have taken to Australia, Ruben Yanez is a 21-year-old who has never played a first-team game while Pacheco is two years older and has played one cup game. That means Keylor Navas is Real's only senior goalkeeper, and he has just recovered from an Achilles injury that kept him out of Costa Rica's Gold Cup campaign. United were better off, but not much now Van Gaal has announced Valdes will leave the club. In addition to De Gea, Van Gaal has taken Anders Lindegaard, whom he did not pick once last season and is in the final year of his contract, and Sam Johnstone, a loan target for Preston, where he spent the second half of last year, to the United States. Neither of those two are viewed as having a meaningful role to play in the coming campaign. Spanish sports paper Marca said recently that United were being "stubborn" in their negotiations, and that the deal to sign De Gea was "stuck in a rut". United executive vice-chairman Ed Woodward has proved himself to be a tough negotiator. His stance remains that to get De Gea, Real must sell Ramos. As the days tick by, that scenario has looked less likely. De Gea is not willing to hand in a transfer request and is content to see out the final year of his contract before completing the move that would take him back to his Madrid-based girlfriend, Eurovision singer Edurne Garcia. When Valdes leaves - there has been interest from Turkey and also an unlikely link to Real Madrid - Van Gaal needs a keeper, whether De Gea stays or not. United had been heavily linked with Hugo Lloris, but the Tottenham keeper could miss the start of the season after fracturing his wrist. Elsewhere, Asmir Begovic, has signed for Chelsea to replace Petr Cech - Arsenal's latest goalkeeper. The Red Devils are in discussions with free agent Sergio Romero after the 28-year-old Argentina international left Sampdoria last month. 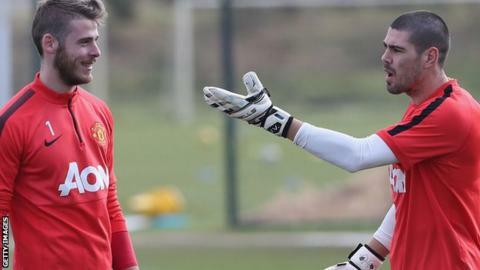 And a deal for Ajax's Jasper Cillessen - who started every match for Van Gaal's Netherlands team at the 2014 World Cup - has also been suggested. But given the Valdes situation, is it possible Cillessen or Romero could be signed as a number two goalkeeper, rather than a number one? What has the manager previously said? Van Gaal was repeatedly asked about De Gea's future at the club as the season drew to an end, when the Spaniard collected the club's player and young player of the season awards. At one point, the Dutchman claimed it was "not easy to choose" between United and Madrid, saying: "David De Gea shall not leave us so easily because we are a great club." A week later, Van Gaal insisted: "I believe still that David De Gea shall stay." It all adds up to a rather confused situation, with a few twists to come before the transfer window closes on 1 September.